Ask your MP to help bring back onshore wind. Onshore wind is cheap, popular, and a vital part of tackling climate change. But a group of MPs have been campaigning against it - and they’ve persuaded the government to block new wind projects from even getting started. To bring back onshore wind, we need to show the government that most MPs agree with the British public - they want to see more wind power in the UK. So we’re launching a public letter from MPs to the prime minister - asking her to remove the blocks that have been standing in the way of wind power. Will you email your MP asking them to sign the letter? We’ve got a template email for you to use. If you’re able to add your personal experiences and reasons for supporting wind, that will really help you to get your MP’s attention. To read the letter and see which MPs have already signed up click here. Resources and tips to get your MP backing wind. Find out how much electricity is being generated from UK wind turbines right now. Some of the most common criticisms of wind power and the best way to answer. 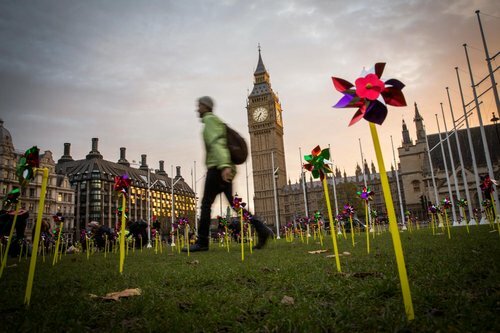 Wind-lovers travelled to Westminster to pull MPs out of Brexit talks and into conversation about clean energy. We asked onshore wind fans for their experiences of talking to their MP about onshore wind and climate change. Got a Conservative MP? Meet them in parliament to get them wised up on wind! Most MPs vastly overestimate public opposition to onshore wind and don’t realise how cheap it is. It’s time to set them straight. Some MPs really don’t like wind turbines. So we asked the people living in their constituencies what they think of wind. The government has just agreed to remove barriers for existing wind turbines to rebuild and upgrade. Happy Global Wind Day. Here are a few ways to celebrate wind! Record breaking support for onshore wind! Support for onshore wind is at an all time high… but who are the haters? We just delivered a letter to climate minister Claire Perry demanding she back onshore wind. 19000 of you stood with us. Investigation: has the government’s onshore wind ban worked? The government's ban on onshore wind turbines has meant a 94% drop in applications for new projects. Write to your MP. Give some shares in a community wind turbine this Christmas! Your loved one will get a great return on investment for 20 years, and everyone will get to enjoy a bit more renewable energy. Fracking vs onshore wind: the system isn't fair. The planning system is rigged against onshore wind. Communities who want to build it aren't allowed. We're calling on the government to make the system fair. A beautiful poem about wind power written by a 10:10 supporter. Fracking, nuclear and wind: which would you rather have in your backyard? Turns out 65% of people would be happy to live within five miles of a wind farm. Co-operatively owned, super cheap wind turbines are the order of the day in Germany. Last week Mean Moor wind farm was owned by a company. Now it's co-operatively owned by the community! We took at trip to Westminster to try to give shares in a community wind coop to communities and local government minister Sajid Javid. Local energy is the future. But the Big Six don’t like it. Now they’ve used their influence over the regulator, Ofgem, to make yet another stand against the tide of change. Check out some of the coolest stories of wind power from around the world. Support for onshore wind just hit the highest levels ever recorded. Basically people <3 wind. Together, we've been asking the government to give wind power financial support. But that's not the only problem wind turbines are facing. The budget: where were renewables? 33,000 of us wanted the government to back onshore wind and solar in the budget. This is what the chancellor said. Ever had a picnic ruined by a surprise summer shower? We showed our love for wind with pinwheels! This Valentine's Day we swapped red roses for pink pinwheels to show our love for onshore wind.